Top reinforced with welded on "hat" channel frame. Sound-deadening tape between channel frame and top. 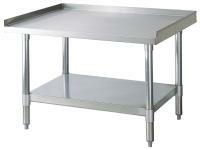 Galvanized undershelf and gussets are standard on all models. 1-1/2" upturn on 3 sides.